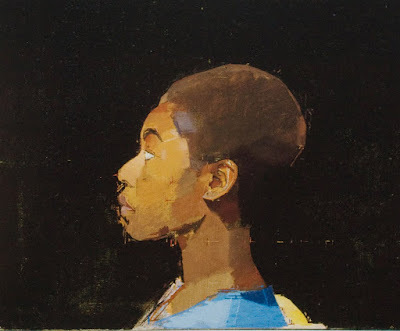 In view of the interest in Euan Uglow I thought I'd say a few things about what I understood from his teaching. I was taught by Euan for all my 4 years at the Slade and I’ve used speech marks where I am pretty certain of his terminology and meaning and use of words that were constantly on his tongue when explaining stuff to me. Euan was crazy about geometry and he knew a great deal about the methods of the Egyptians with regard to geometrical construction. 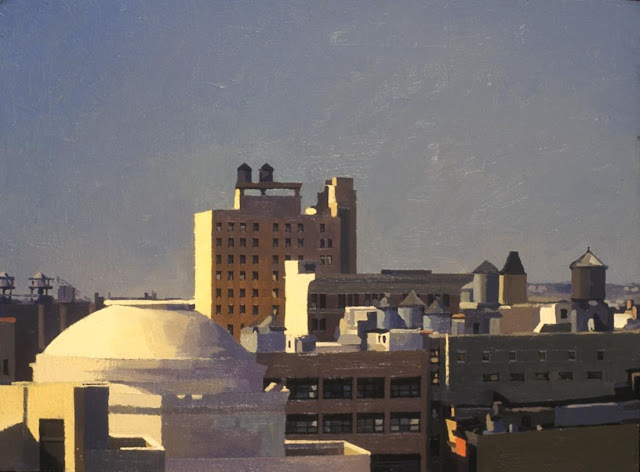 This obsession was something he shared with another painter I knew and was friends with, Patrick Symonds, and relates directly to the length of time he spent on the paintings; particularly the big pictures, ‘the machines’ as Euan liked to call them. He was not interested in “painting something out of the corner of the eye” but wanted to “attack” it head on. Everything was to be looked at directly and “in focus”; he wasn’t interested in painting the sensation of a glance for example. He would look at something and ask himself “How can I make something out of that?” The emphasis here is on ‘make’; an optical experience needed to be “nailed down”. “I can easily splodge something down in an hour or two. But such paintings do not interest me,” he said. He used to laugh about Delacroix’s admonition to be able to draw a man falling from a building before he hits the ground. This desire to “make something out of” what he was looking at meant he was obsessively fastidious about maintaining the constancy of the set up which was arranged to accord with a pre existing idea. The painting ‘The Diagonal’ is a good example of this. So strong was this “idea”, that when a model gave up on him he would hire another model and continue the same painting with the new one. (I know this to be true because the first model for ‘The Diagonal’ Suzy King, gave up after about 6 weeks and was replaced. I shared a house with Suzy in London for 4 years during my student days at the Slade and she told me this herself). The business of “making something out of” involved heavy uses of geometry. But it was geometry mined out of the model set-up itself, never imposed on it once the painting process had started. He did this “To build harmony into the image,” a patient “investigation” into what made the image tick. 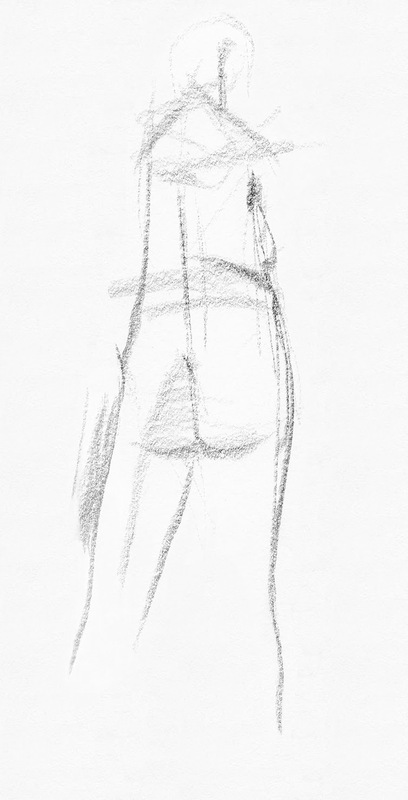 I remember asking him about a painting I was working on and saying that I found the light on a model’s foreshortened leg absolutely marvelous and wanted the painting to be about that. “Find out why it’s marvelous, what makes it marvelous,” he said. “I won’t let chance be there unless it’s challenged”. The nature of that challenge was to dig into the wonderment of what he was looking at with geometry. 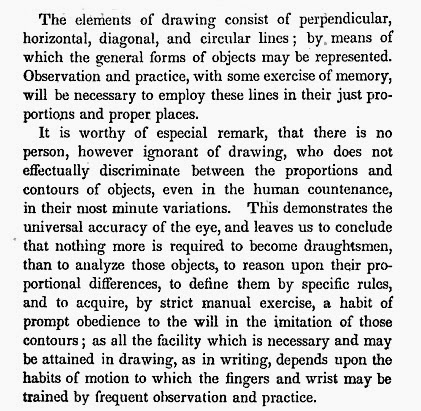 However, the geometry and obsessive measurement that “trapped” the optical phenomenon he regarded as in no way an answer to the miracle of the model’s appearance in front of him; it was not an explanation of its beauty. 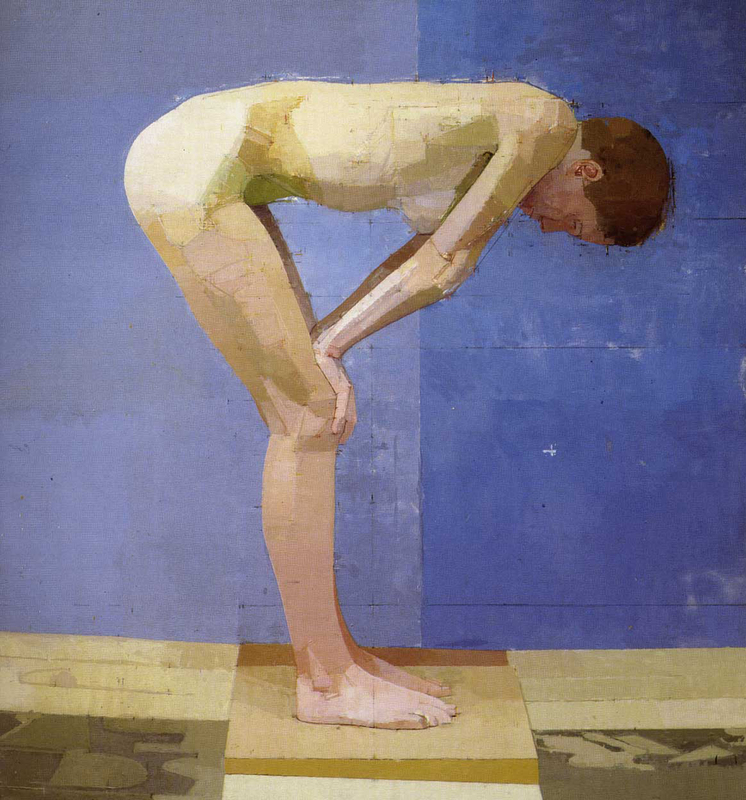 Geometry, for Uglow, was a means of objectifying his subjective response so that he could “remake” the phenomena in front of him. Geometry was a tool out of which he constructed a paradise in faithful parallel to the model’s unassailable miracle of existence. If the geometry came out of her, then in some way he felt he had touched the flame itself, albeit vicariously. Hence the inordinate amount of time spent on these paintings in relating every mark to the harmony of the rectangle’s proportions. 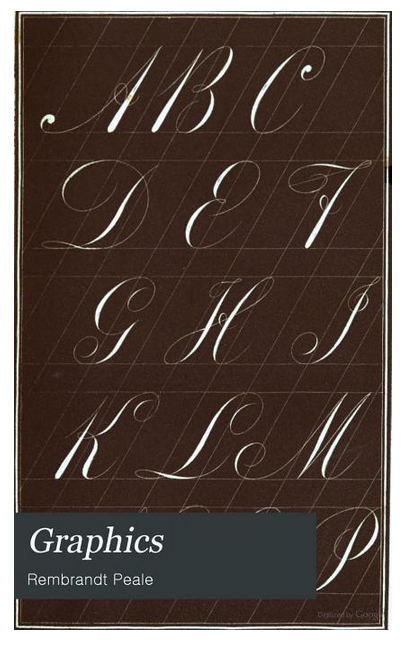 (Hence his love of root rectangles – “I like a rectangle with reason,” he said.) It was a way of becoming intimate with the subject. A method by which he could rid himself of “assumptions about what the model looked like.” “Innocence is not the same thing as naivety” he once told me, sagely. A sort of pragmatic meditation, if you will. And although a thoroughly pragmatic soul, Euan believed in the “magic moment”. “I get about one a week after painting for 5 days from the model, it’s not common, – how many do you get?” he once asked. He became increasingly “excited about colour” as the years passed. The fruit pictures are “about colour”. Colour was seen as volume. Thus the painting of a lemon was an attempt to represent the “presence” of its volume by colour. 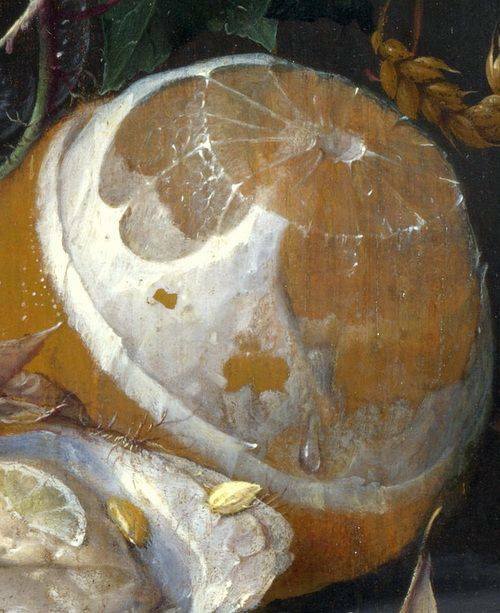 This was why the fruit pictures were so often as flat as possible; the yellow became the lemon as it were. This was why he raised up the shadows to as high a key as possible without them ceasing to read as shadows. Thus his pictures explained form through shape rather than chiaroscuro, and, as much as was possible, by its local colour. But what that local colour was, was never assumed. He loved to be surprised by colour. “Something has to happen,” he said, when one colour buffets against another. But not so that it could be made to look pretty - he considered prettiness for its own sake as extremely vulgar. These buffetings of colour in his paintings, or colour sequences, were derived from the model as much as the geometry. If something "happened" when the colours were next to each other, then they were de facto, beautiful. 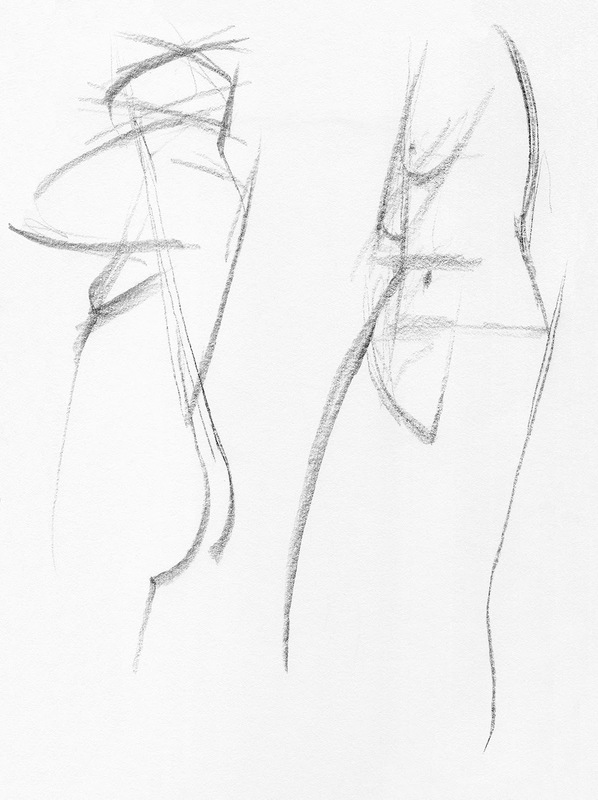 "Happened" referred to their ability to affect the drawing. The shapes that he selected from the infinite variety suggested by the model were as much governed by the colour as how well they drew or "explained" the forms. “A carpenter making a good joint is drawing beautifully,” he said in one monograph. Change the colour and you have to change the shape. Change the shape and you have to change the colour. They are mutually dependent. Thus, over time, he could extract and “learn” the colour scheme of the model. As the painting progressed he would start to organise the colour into the idea developing out of his constant looking at the model over the weeks and months. Slowly, he could make chromatic decisions about the organisation of the colour secure in the knowledge that what he was dealing was sourced from the model and not other paintings he knew about. This was, I believe, how he was able to continue to work from fruit that had literally collapsed into a pile of mould - there was a painting in his studio of a ripe peach being made from a black, withered blob sitting behind the plumb lines and marks of his set-up. Strange, but entirely true. This was not always the case of course. “Every picture is different” and he discovered new rules with each painting. This was the “idea” he was painting. 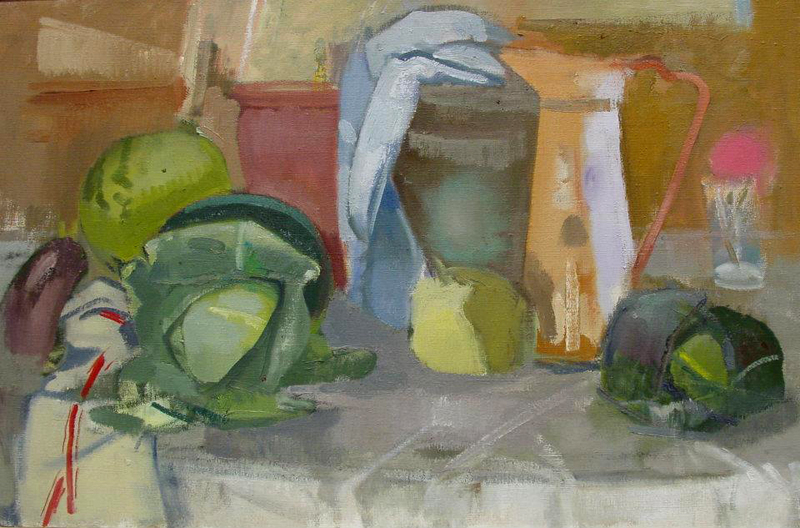 An idea that gave birth to the painting, for example: three colour primaries arranged as a pyramid of fruit. But often a new idea would emerge from the encounter with the set-up itself. The tyranny of preconceptions and how to avoid it was why he evolved his extraordinary procedure. A preconception was antithetical to discovering something worth painting about. 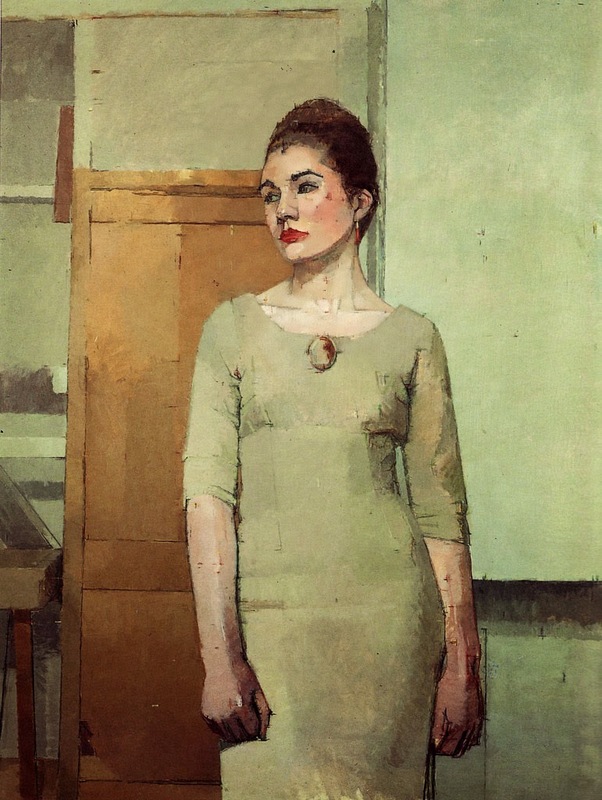 — Chris Bennett studied with Euan Uglow at the Slade School. Bennett lives in Sudbury, Suffolk, England. Patrick George died in April this year, a few months short of his 93rd birthday. Early next year there will be a memorial at the Slade School of Art - where he taught for 4 decades - and an exhibition at Browse & Darby. However, before then Cobbold & Judd are organising a retrospective exhibition at the Minories Gallery in Colchester. Patrick George featured in the seminal “Eight Figurative Painters” exhibition curated by Andrew Forge in 1982, his only major appearance in the United States. 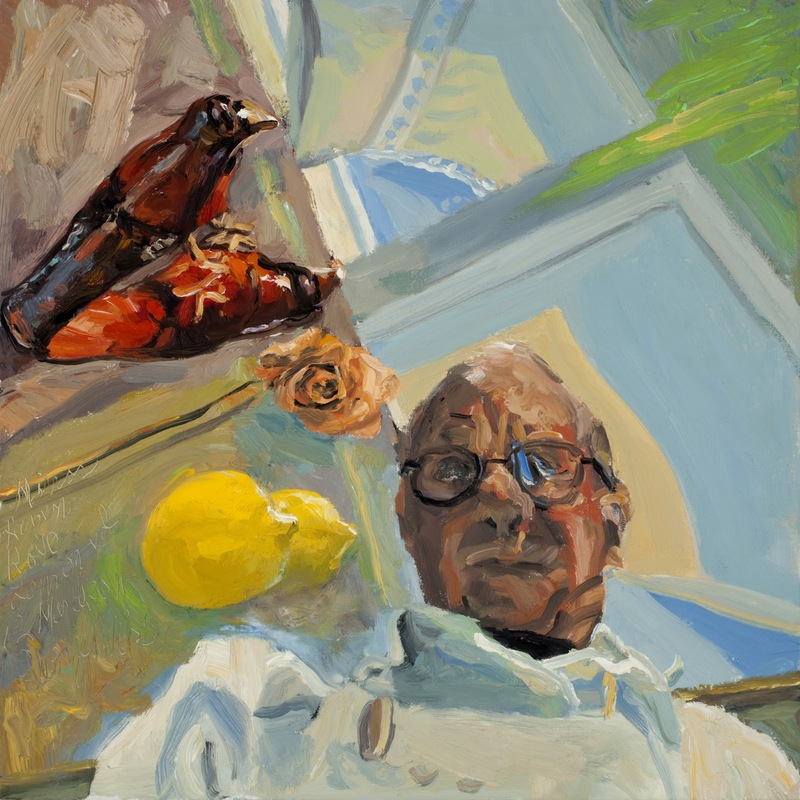 His co-exhibitors were Francis Bacon, Euan Uglow, William Coldstream, Frank Auerbach, Michael Andrews, Lucian Freud and Leon Kossoff. That Patrick is not as famous as any of them is in a large measure due to his modestly and lack of worldly ambition. As a consequence his work is not nearly as well-known as it should be. 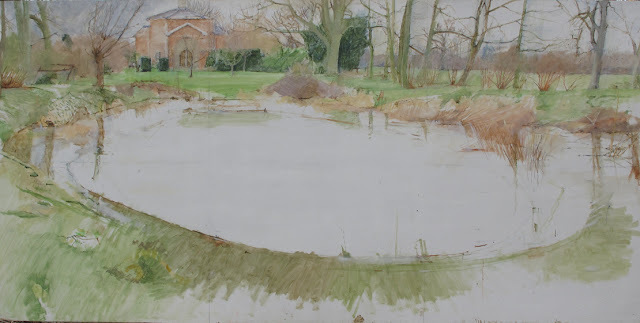 The Cobbold & Judd exhibition consists of approximately 40 works spanning Patrick’s career and includes drawings made in the late 1940’s at Lower Marsh (behind Waterloo station) where he shared a house with fellow painters including Andrew Forge, Christopher Pinsent and Myles Murphy. 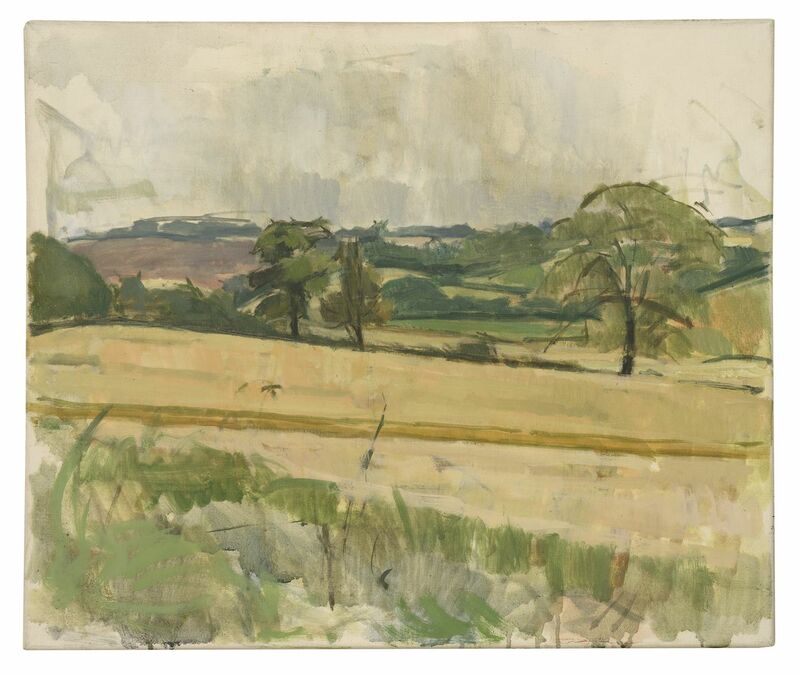 Patrick’s early maturity as an artist is demonstrated in an impressive landscape of Sheepscombe in Gloucestershire. 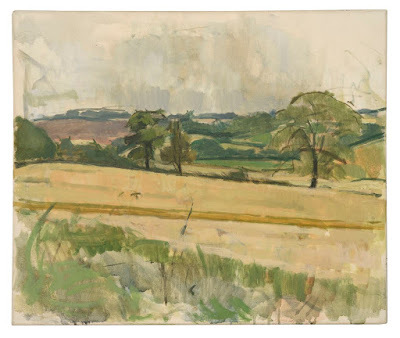 In 1961 he moved to Hickbush, a tiny hamlet south of Sudbury in Suffolk, where for 25 years he painted many of his most impressive landscapes. The Tate Gallery owns two examples. The last 30 years of Patrick’s life were spent in an eccentric hexagonal folly called “Grandfathers”, a few miles outside Bury St Edmunds. The largest painting in the exhibition depicts “Grandfathers” surrounded by trees. In recent years Patrick’s work became more instinctive and open-knit. A late interest in the work of Pierre Bonnard suggests how far he had come since the days of Euston Road-inspired monocular measurement. 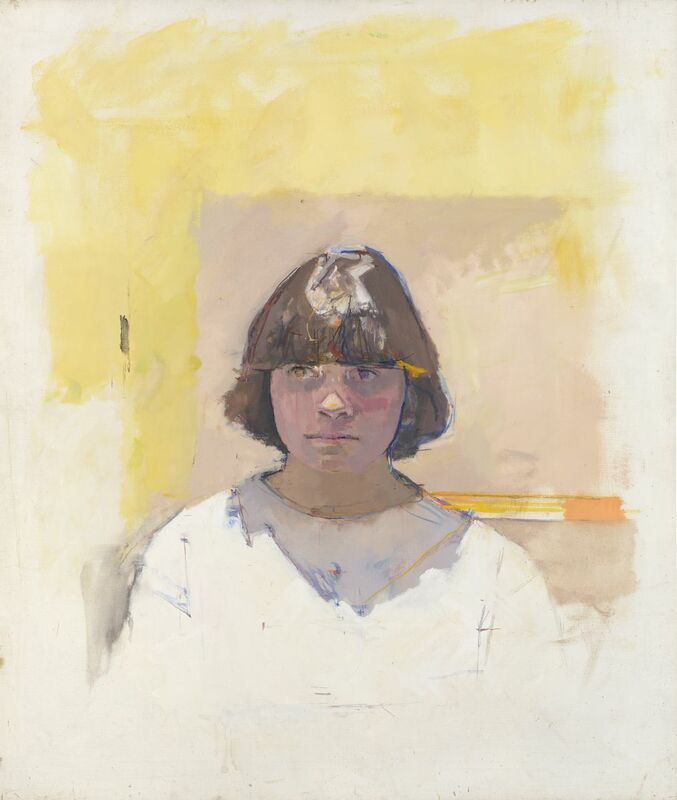 Although the majority of the works in the exhibition are landscapes, Patrick George also produced a number of high quality portraits. 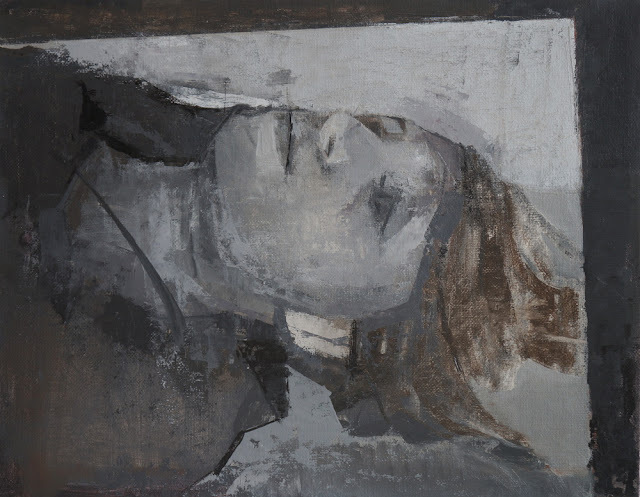 Arguably the finest of them, “Hilary Lane, Night Painting” features in the Minories show. It hasn’t been exhibited since his major retrospective at the Serpentine Gallery in 1980. In an excellent documentary film made towards the end of his life, Patrick discusses this portrait and with typical understatement describes it as “quite respectable… might even be called interesting”. Well, yes. It might also with some justification be called one of the most impressive and original portraits painted in England in the last 70 years. takes a lot of focus and a developed confidence in mark making. This can only be reached by drawing constantly. The artists I choose to look at — Post-Minimalist sculpture and the Land art movement — include Richard Serra, Clement Meadmore, Michael Heizer and Andy Goldsworthy. 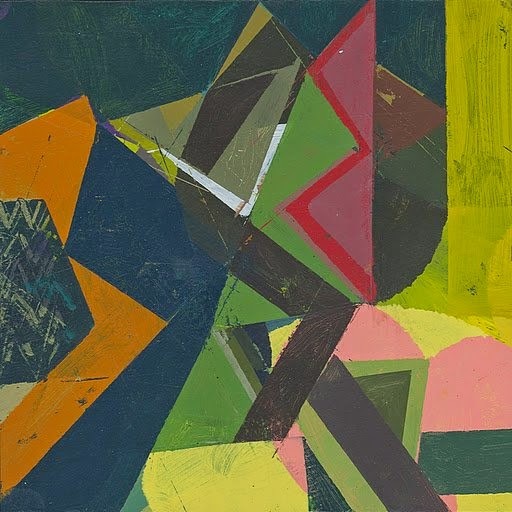 Even though these artists' ideas may differ, they have a shared interest in infusing geometric abstraction with gesture, and using non-traditional processes, materials and forms. The forms are kept simple. As a result it is open for interpretation from one's own experiences, demanding personal aesthetic perception from the viewer. 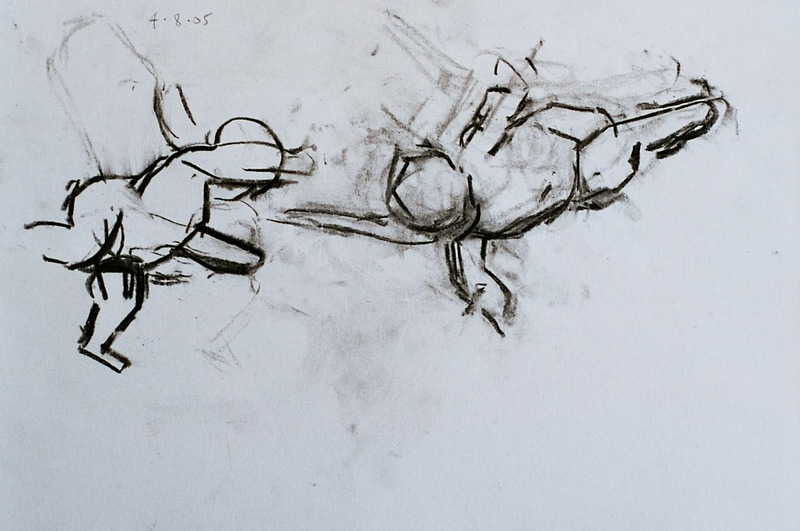 I see drawing in these artists' works, a play of horizontal and vertical lines in contrast with curved lines. The curve symbolizing fluid and dynamic aspects; the straight line symbolizing the static, structural and orderly. The two combined create a powerful and dynamic composition. I try to achieve this in my own drawing. In music, Miles Davis, one of my favorite musicians, uses notes economically, playing simple, perfectly phrased melodic ideas, and using space to imply more than what he is actually playing. If an artist can appreciate and see beauty in simple things it will reflect in their own work. 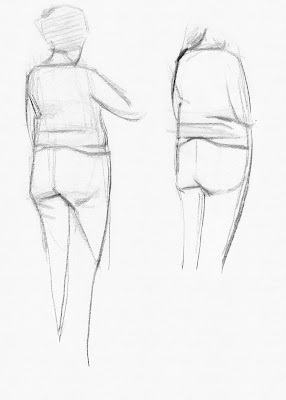 Drawing for me is basically responding to a subject and working intuitively to find the right placement of lines and shapes in relation to one another — deciding what to add and what to leave out. Finding these lines is a compromise between seeing and feeling. “What is it for?” Garrison Keillor's mythical house-cleaners the Jettison Brothers ask, “When did you last use it?” If you can't answer either question — Out. It’s an uneasy joke, reminding us of just how complicated is our relation to things. Think of a house sale and of those hundreds and hundreds of possessions laid out for bids, each one imprinted in its own way with use, care, neglect, memory, pride, indifference, carnival or lent. And how these imprints fade — from living attachments, through some sort of melancholy haze to nameless rubbish. One man's treasure another man's junk, and vice versa. The pathos of objects fascinated Van Gogh. His boots, his pile of yellow-backed French novels carried a heavy freight and their worn heels or dog-eared pages spoke of a view of the world. 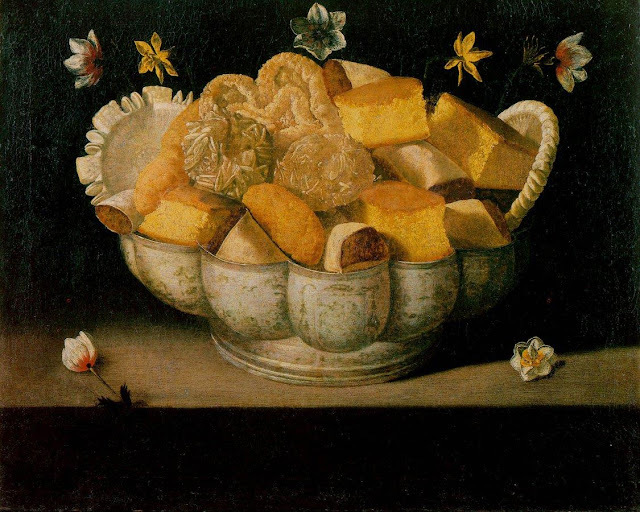 In its early days, of course, still life was all about objects as emblems. Everyday connections could be diverted to grand purposes of love and status and death. Since Romanticism put painting on the road to autonomy, still life has offered the example of ‘pure’ painting. 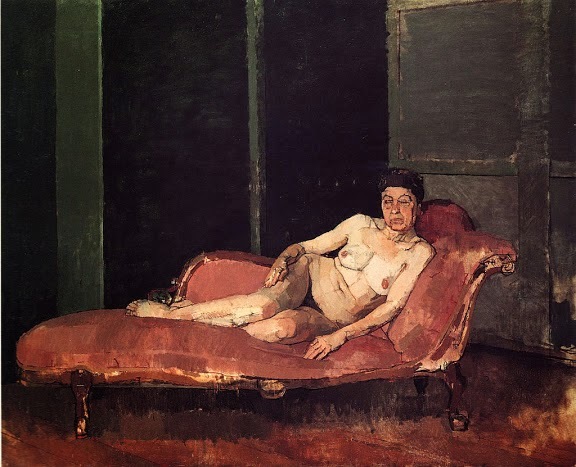 Cezanne's instruction to Vollard: "Sit like an apple." 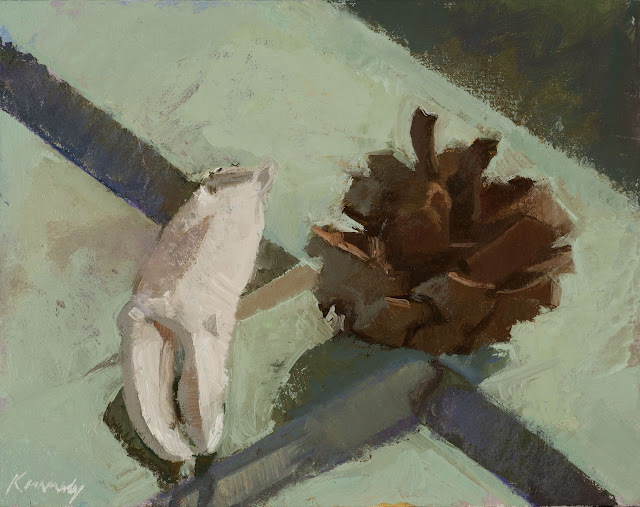 In practical terms, the feature that distinguishes still life from any other genre is that the painter's power over her subject isn't limited to the canvas but can extend in a literal way to the subject itself. She chooses, arranges, commands. 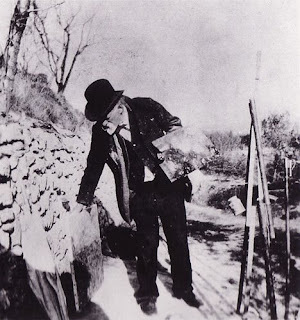 She can add or remove, line up or disarray at any point and, as if playing both black and white at chess, she can set up traps or force solutions on both sides of the board: Cezanne tilts his plates on a coin; Morandi paints his bottles white; Soutine arranges his tomatoes in a coronet. Hand and eye command the table no less than the canvas. This is not the same as asking the model to turn his head to the right, nor is it the same as making things up. 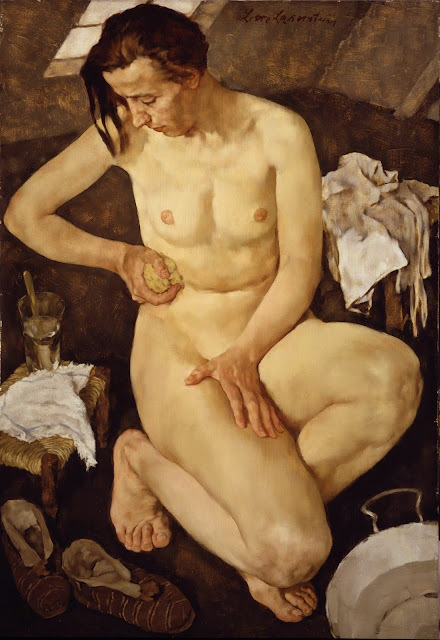 First, the painter has to break through that tissue of connections that tie objects to living use and to see them as pure appearance. A napkin, off the dining table and into the studio, is folded into a white patch or a cloud or a mountain. The juicy ripeness of a handful of cherries is set aside so that their scattered pattern can be secured; the horror of a pile of sheep's skulls is neutralized for the sake of geometry. And then a return! Suspended meanings and cut connections are restored in new and more demanding registers. A dead chicken's wing that Soutine had exploded into smears and jets of paint, comes back with as much chicken energy as it ever had in life, only now stronger for being fixed in tension like a set trap. The plums, whose purple Bonnard had stolen for the sake of the orange-gold sunlight streaming in behind them, are miraculously restored in their blooming fullness, reconstructed by the eye that takes in the whole painting. If you like what you see then it seems natural to try and describe the thing you like. Painting is an expedient way of doing this. But why from a single viewpoint? When I notice something I stop to look at it. It has always seemed to me that my way of looking corresponds to a series of single views, and I do not think they are views seen in the round- my visual experience does not correspond to the experience of free standing sculpture, when there is more round the other side than I expected. I believe I see in views of high relief, for instance the angle between the pavement and the houses is opened out more than 90°. Also because it is the particular relationships from a single view that are interesting. It is usually from just somewhere that I am struck by what I see and nowhere else will do or be the same. At once my position becomes significant, and the longer I stay there the more important my position becomes. The subject holds me fast by radiant lines to my eye like guy ropes to a tent pole. One more reason is that it is the only way I have found of making a representation of what I can see and so being able to catch some indisputable facts that do not simply depend on my opinions. It is not easy to see. The partiality of vision is well known. The selection of what is useful to see for everyday life varies with each person. Some people hardly look at all. They use a code of recognition similar to the abbreviations of recognition used by the army- ‘all trees are fir trees or bushy topped’. Everyone has their sight conditioned by every experience, not by any means just visual experience. We are all prejudiced and very conservative in what we recognize from what we see. It would anyway be impossible to get through everyday life if we looked at everything. Few people are interested in looking at the actual appearance of things and few painters are interested in the problem of painting what they see in front of them. Painters look at pictures, their own, fine art, coarse art, photographs, advertisements, everything, so what they choose to see is not only conditioned by their everyday rationalization, but includes their own aesthetic preference; it is likely that they only choose to paint what is paintable and what echoes their experience of paintings. But if it is not easy to see it is certainly more difficult to translate what you see into two dimensions even from a single viewpoint. By this I do not mean a fixed stare, but using the amount of scansion necessary to view the subject. The picture starts off uniquely. Each seems brand new and different from any other and the painter has high hopes and an arrogant assurance of success. The paint looks beautiful on the clean canvas and the subject looks innocent. One hopes to ride in like a surf bather on a wave of enthusiasm, but the doubts come, are ignored, but persist. The subject changes, wriggles clear and is inviolate and the canvas looks like paint. The picture comes to a stop, the subject still looks beautiful, perhaps in a different way, and the canvas looks like yet another of one’s pictures- it is a moment of despair, when one understands the absolute difference between the canvas, the horrible canvas and the beautiful thing one sees. One has lost, so one casts about for anything, anything that will establish a connection between the canvas and the thing one looks at. I think it is possible to establish some sort of elementary comparative similarity between the canvas and the appearance of the subject. Looking at a window it may be possible to tell whether it appears higher than it is long and it is possible to mark off on the canvas two distances with this comparative similarity. So one builds up a system of empirical proportions- the distances and intervals alike and unlike, the same, greater or less. Each time one finds a new ‘position’ and its corresponding ratio with what has gone before, so one more comparative fact has been gathered from the subject and each is precious, particularly the ones of absolute certainty- slowly the picture accumulates information, the like distances and intervals make a rhythm which multiplies across the canvas. The first distances become significant units and their length(in fact the first distance) is the measure of every other position. The subject is still as completely beautiful, the canvas acts like a ledger; the marks of interval describe what has been found out. They are selective, but in so far as the answers are correct they are outside the influence of opinion. A number of positions can be described by a line. The object can be seen in terms of a collection reciprocal lengths. The lengths smaller or longer depending on the proportions of the object, the distance away, and the angle they make to the eye. (It is not easy to see the receding railway track as a near-vertical line.) 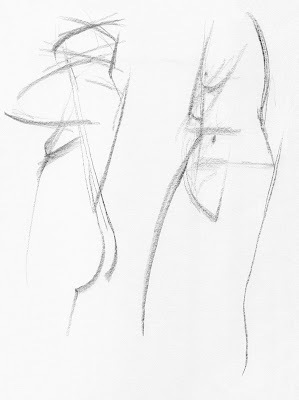 The first line on the canvas is qualified by the second and so is understood to be longer, shorter or the same, and the lines of apparently the same length echo each other. The lines have direction; they point in the same or different ways implying movement that is halted or reinforced; they lie on the canvas and their tilt and balance make an equilibrium with the rectangle. They may join end to end to become an articulated line whose length is made from the sum of the parts, they grow like a shoot into twigs and all the articulations are like branches of one tree. 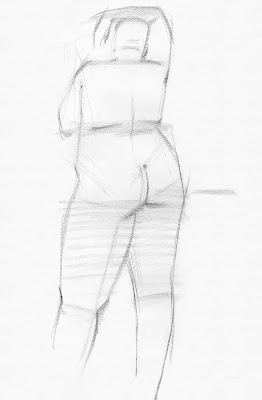 Seen simultaneously the articulated line becomes a character. The appearance of the object is translated into these characters. The characters whose shapes depend on the viewpoint(because they do not exist in the actual object) can, if made without mistake, lead to an unprejudiced account. If the articulated line joins on itself it cuts off an area of the canvas. The area is described by the lines like a field surrounded by hedges; the limits of a field may be described by hedges, but the field is not the sum of the hedges and the shape is not the sum of the lines. These shapes particular to your point of view have to be identified as two-dimensional patterns so that they may be made on your canvas. A rectangular tabletop cornerwise on becomes a diamond shape. When things are placed on the table the top is obscured and new shapes are made. If the objects overlap they lose their familiar outline: the side of a matchbox becomes a yellow flag, piece of table a cooling tower, the arrises of the inkwell cranes and signal arms, the half-seen dish a moon. 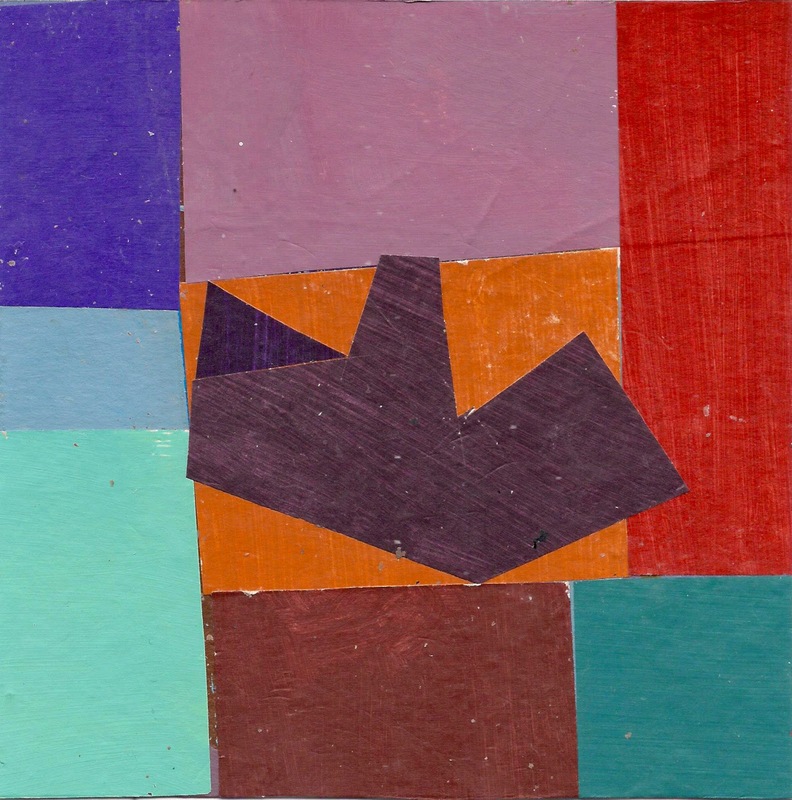 The shapes are juxtaposed into an irregular mosaic. The adjacent shapes condition each other by their common boundaries until they lock together and form a third shape that encloses them both and is more than the sum of the two. The shapes expand, each continually refined to accommodate the last, and the last by a series of compound comparisons influences the appearance of the first. The shapes expand until they add up to a description of the diamond-shaped tabletop. Some shapes are more difficult to see than others- if the real-life shape is in elevation then it is easier to translate it than if it is seen obliquely, like the tabletop or a field. It is the oblique shape, the surface running away from the canvas that is the difficulty. It is incompatible with the surface of the canvas. In the translation one’s mind has to force the far boundaries forward and the near surfaces back so that they can be comprehended in terms of their optical appearance. Malevich’s picture of a single yellow plane receding into infinity seems to me a marvelous illustration of the crisis of appearance. I believe everyone is aware of this when they stand looking over the sea. The impossibility of mentally tipping into elevation what we know to be a huge flat area stimulates our appreciation of what a great distance we are looking over. We are never more aware of how far we can see away from us than in the absolutely flat parts of East Anglia; mountains which are landscapes in elevation, do not so particularly stimulate our sense of distance. 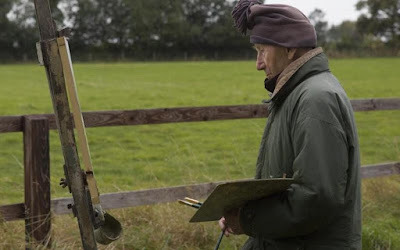 The single viewpoint painter has to make the difficult imaginative effort to see the horizon and foreground in the same plane, the plane the shapes occupy on the canvas. co-ordinating the proportionate lengths and intervals and directions. The marks are made again and again until the pattern rings true, or as true as the painter can make it, the actual look of the picture is determined by when the painter leaves off, and often he does so for quite circumstantial reasons; the leaves fall off the tree, the model cannot come any more. But the amount of contact that he manages to correlate mainly depends on his own capacity; obviously great painters can manage more than less great. The picture at first seems to go swiftly, but as more information is gathered and brought to bear on what has gone before the pace slackens off like a graph that first rises steeply, but as time passes eases off until the curve flattens out and hardly advances against the time spent. The changes get smaller but are as difficult to make. Like the tide coming in, the waves go back and forth and it is often necessary to spoil what is done before the painter can get further. Sometimes the wave goes out and does not come back, but in any case the picture will never be finished. The knowledge and selection from the appearance of the subject always changes and there is no absolute solution. The picture does not stand for a reflection of the object but for a prejudiced account- for the visible compound of experiences and the efforts to translate them in front of the object. *with an inordinate amount of quotations from other artists and writers. Other writers (usually painters themselves) have written far more perceptively and intelligently than I ever could — I would urge anyone interested in drawing to read Patrick Heron’s essay on Constable’s drawings (1). 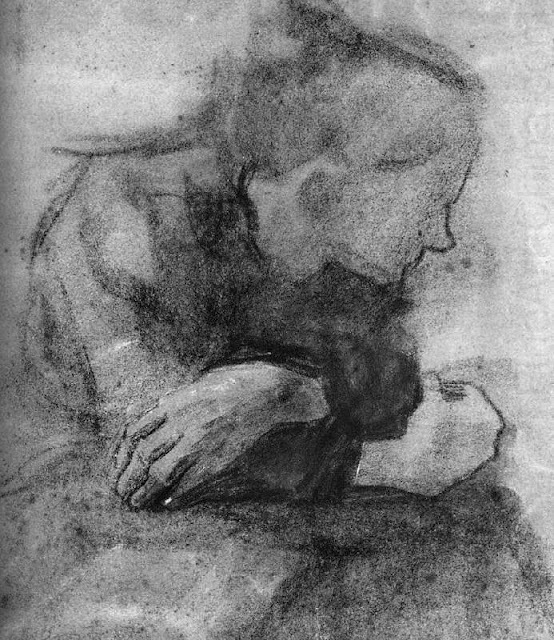 Sargy Mann has written so well on Bonnard’s drawings (2) that I imagine anyone reading his commentaries on that artist comes away with an enriched experience. Both these artists write so well about the nature of drawing itself that it would be futile for me to try and do anything other than point you in the general direction of their writings (see list at end of this essay). Sargy Mann in particular explains very clearly the difference between illusionistic drawings (which only tell us what we already know) and “real” drawing. Drawing and painting are very closely combined. 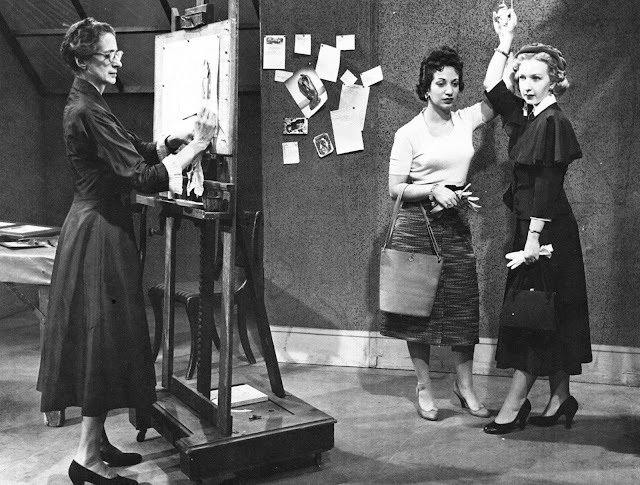 This might seem a surprisingly obvious statement: after all, the act of painting could hypothetically be broken down into drawing, colour and tone – yet some serious observational painters nowadays hardly draw at all. 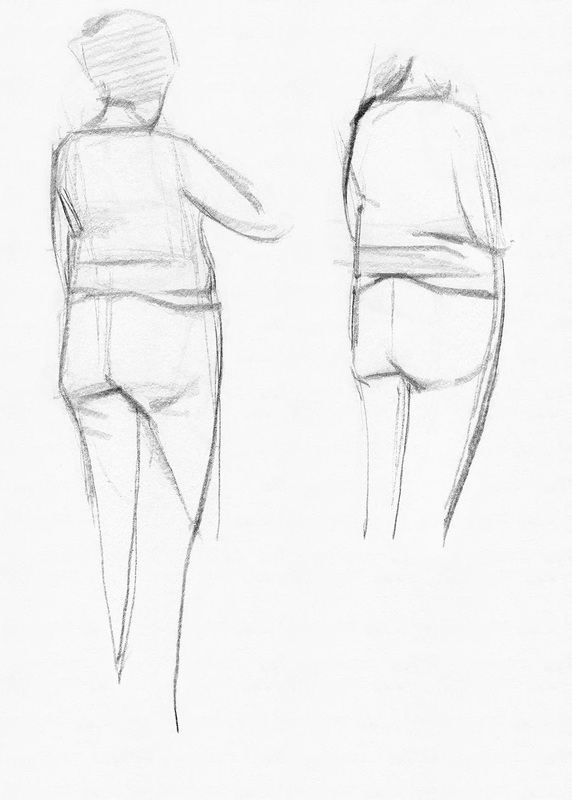 For me, regular drawing (with a pencil) is necessary for me to “get my eye in.” In order to perceive colour-shapes clearly, I need to draw first. 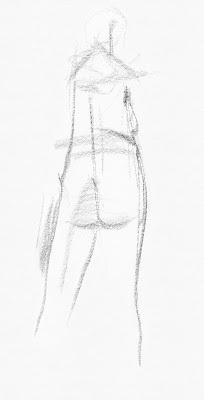 Drawing — really drawing — is really difficult! A cityscape from life. The light is from 8:45 a.m. to around 12:45 p.m. Different time of day for different parts of the painting. It's from a large 9th floor balcony of a university I teach in. I painted while standing on a stool to make the view possible. 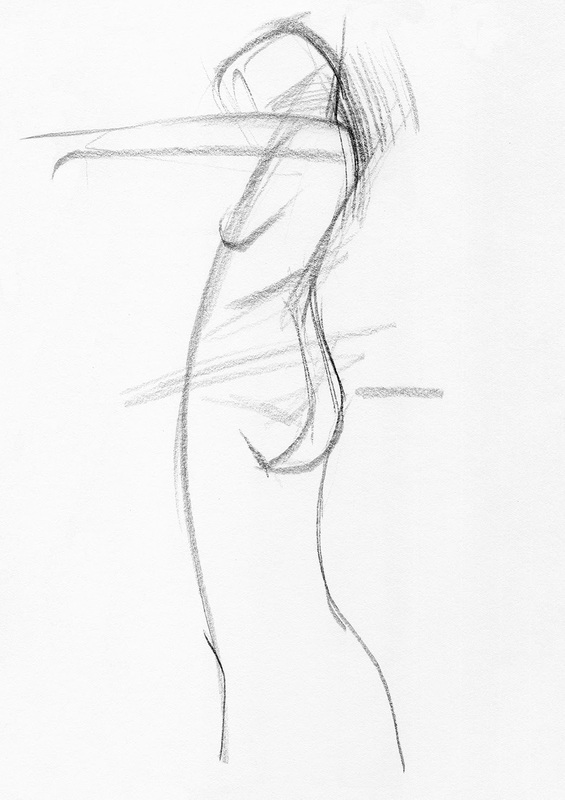 The viewing angle is wide enough that the perspective on the right side begins to warp. I guess it is a phenomenon unique to observational painting — unless one is using a wide-angle camera lens. If the lines were straight, the painting would look more “realistic.” That has always struck me as the fundamental difference between a realistic painter and an observational painter. The observational painter paints the world as he sees it, even if the resulting painting does not fit the accustomed paradigm of realism. 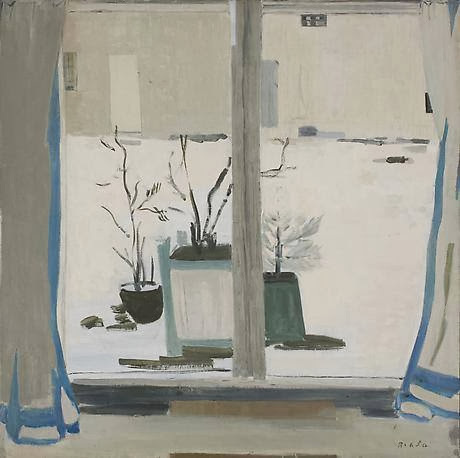 I have thought that Fairfield Porter was as close to a pure observational painter as there was. I wonder if that's why his paintings were so hit or miss. An exhibit of paintings at Grunwald Gallery of Art, Henry Radford Hope School of Fine Arts, Indiana University, Bloomington, featuring work by Catherine Kehoe, EM Saniga, Ken Kewley, Eve Mansdorf and Tim Kennedy. Small paintings that stand on their own – as a category distinct from painted studies – are capable of producing a powerful effect on viewers. Paintings done on small scale communicate intimacy. 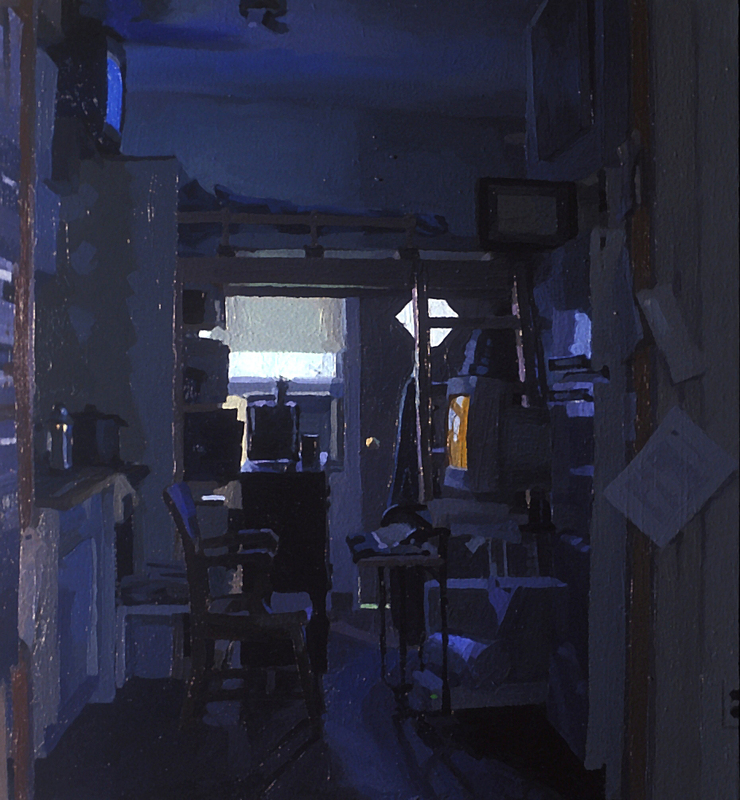 The viewer becomes intensely aware of his or her own space as well as the space in the painting. Viewing a small painting one can feel the contradictory sensations of nearness and distance experienced simultaneously. We see the artist’s hand in the marks on the surface of the panel or canvas that magically transform themselves at the same instant into a house or a flower – and then back again. It is an endless circuit that produces the hypnotic illusion of stopped time. Article about the show on Indiana Public Media website. 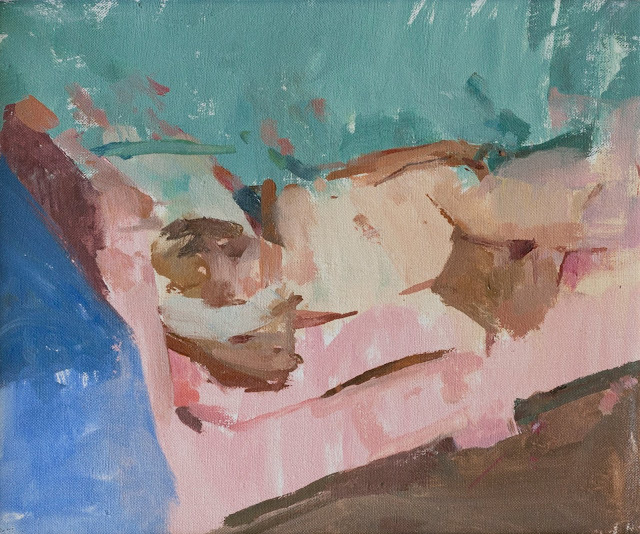 The following questions were asked of the painters in the Small is Big show, at Grunwald Gallery of Art, Henry Radford Hope School of Fine Arts, Indiana University, Bloomington: Ken Kewley, Eve Mansdorf, Tim Kennedy, EM Saniga and Catherine Kehoe. The artists’ replies are below. Artists are listed by last name, in alphabetical order. The physical terms of confronting a small painting are quite different from the approach to a large painting. The space of a large painting can envelop or contain a viewer: architectural in a way, like a room. 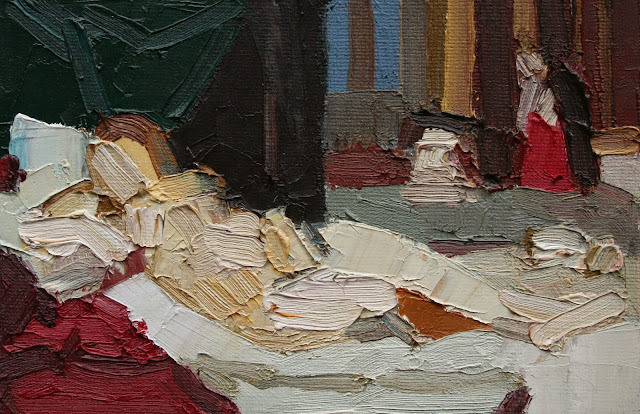 The small painting exists at a permanent distance, its space accessed as if through a portal. 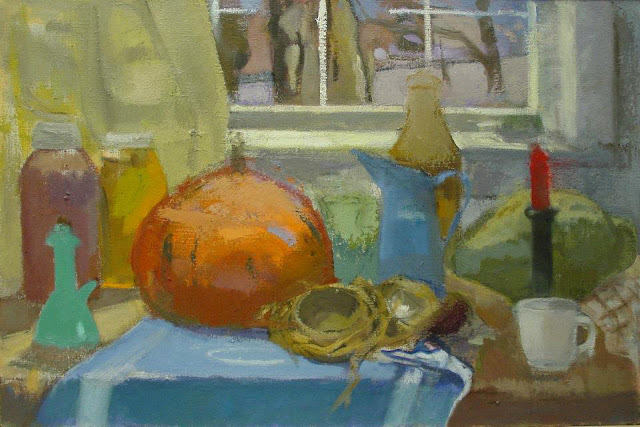 There is a crystal ball aspect to a small painting: we peer into it. Like the twisting of a kaleidoscope, the images turn and hover on the edge of recognition, often without clear context. Skilled interpretation is required, and sometimes outright divination. That is, in relationship to painting the world. We are in constant motion and the motion seen with two eyes gives us information about our place in space and the relationships of forms within space. We have since babyhood developed a keen understanding of the world as form and space. We use this knowledge plus the flat world we see (if we don't move) to paint images. What is the flat world we see? Monocular vision? Even though we have two eyes, what we generally see is one clear object. Or think we do. Up close if we look with only our right eye we see the object and a background. If we close our right and look at the object at close range with our left eye, we see the object slightly moved and the background moved quite a bit. Because we are focusing on different parts of the site we do not notice this discrepancy. The mind makes it simple for us to see what we want to look at. Like peripheral vision. I remember Dickinson telling us that when we are studying an object to close one eye to see it clearer. And that is monocular vision. These notes run parallel to my own work; they are a work in progress. Love of color makes a colorist. This passion gives one an unlimited vocabulary. Color is used to create steps to direct the eye around the painting parallel to the vision of the artist. Along the way, like a songwriter, rhyming words that may or may not rhyme, we invent color relationships to get at the surprising juxtapositions that are found in nature. 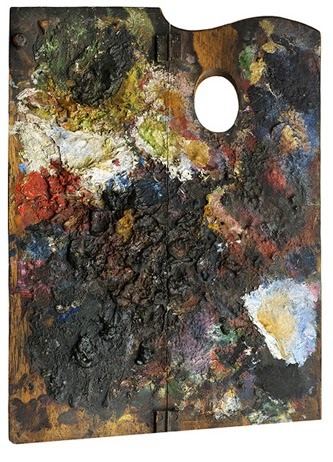 Color, one of those things that matter in painting, is an abstraction. It would be very hard to consciously compose a thousand colors. It is more easily done with a few. One color needs to be found to stand in for several colors. Each color needs to be chosen in consideration of the whole. Color does not become itself until the whole work is completed. A painting that in its early stages resembled a poem, as it gets filled in, cluttered with color that changes or dilutes what was there, loses its poetry. If a painting isn't working, often it is not because something is missing but that there is something that is not needed and therefore harmful. A colorist loves colors as a writer loves words. It is the love that comes through when the mind gets out of the way. Don't think too much. Trust your instincts. We all have the colors needed to make beautiful paintings. I try not to worry about what I do not know, what I have been unable to teach myself. My inabilities serve me better than my abilities. Art is not something that is learnt and then practiced, it is a form of communication and one is always trying to say something clearer. The mind messes up love and it messes up painting. Start as if putting down the one thing that will finish the work. Put down the one color shape that excites you the most, let that color lead you to your next, when you put down the first it will call to mind another, put that one down. It is the visual equivalent of saying the first word that comes to mind on hearing another. You are relating colors. Comparing colors. Finding relationships that excite you. With each color you are relating everything to the whole, attempting to complete the whole. You are emphasizing what interests you and minimizing others, leaving out altogether what distracts. I tend to like paintings where the abstraction is strong. By this I mean that the paint, the colors and shapes, are distinct, like strong actors in a play. Going towards abstraction does not mean going away from representation, from realism. It is more like describing something real by other means than illustration. It is like describing an apple with your hands, forming the shape in the air with your hands, by enclosing an imaginary object with two hands. You do not try to make your hand look like an apple. Paint takes over the role of the hands and does not hide the fact that it is paint. Painting is talking with the hands made permanent.